Last July, at the beginning of a whistle-stop tour of Berlin with my friend Benedikte, I spotted this intriguing poster in a metro station. I’m a sucker for collages, and as far as I could tell the poster was advertising some sort of exhibition about food and design (both of which I’m pretty jazzed about, too), so although we weren’t entirely sure what to expect, we opted to escape the scorching heat and check it out one afternoon. What and how will we be eating in the future? How can food security be achieved in the face of climate change, a steadily growing world population, and intensifying urbanization? Which dietary habits will be abandoned, and which ones will be revived – or will we develop wholly new ways of accessing the nutrients that are essential to our survival? More than 30 designers address these questions, in the process of initiating Food Revolution 5.0. 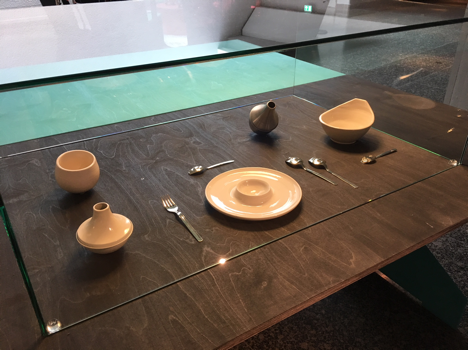 The exhibition is split into four sections that correspond to stages of food production and consumption: Farm, Table, Market, and Kitchen. With more than 30 participating designers, the prototypes in Food Revolution 5.0 run the gamut from unfeasibly whimsical to Why isn’t this already a thing? Keep in mind, it’s Berlin – and a design museum – so there’s a somewhat lopsided balance between right- and left-brained approaches to reframing food and its sustainability. Many of the designs are largely conceptual and unlikely ever to see any form of implementation. Nevertheless, each piece is innovative, thought-provoking, or admirably bizarre in its own way. Here are a few that especially stood out for me. Sky Hive, a seven-meter-tall urban beehive structure, appears early in the exhibition on the Farm level. Created by Dutch designers Janicke Kernland, Daniel Meier, and Robin van Hontem, Sky Hive can be raised and lowered using an electric motor, enabling easy access to the hive. 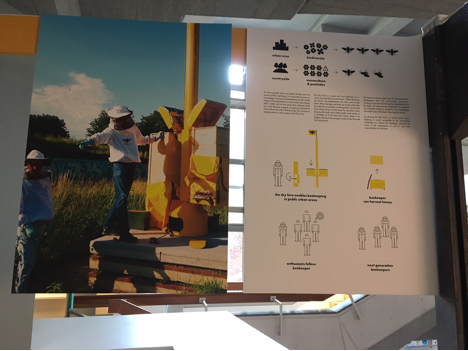 This makes it ideal for cramped city spaces, and the designers stress that it aims to facilitate community knowledge of – and engagement in – beekeeping. It’s also outfitted with an internet platform that “allows easy communication and structures the social process,” as they put it. Given the current crisis in bee population, increased demand for local honey, and the proliferation of urban farm and garden spaces, installing Sky Hives throughout cities worldwide seems like a total no-brainer. I keep thinking about two projects on the Table level that appear similar at first glance, but were designed with very different intentions. Tokyo-based Kosuke Araki’s Food Waste Ware and Anima are dishware made from a mixture of carbonized food waste and animal glue (another by-product of the food industry). 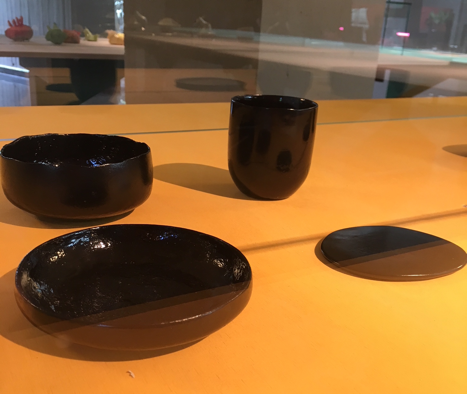 Coated with Japanese lacquer, or urushi, the pieces in Anima are so beautiful I’d gladly use them for meals, and they’re even more impressive when viewed alongside photos of the food waste that Araki used to create them. 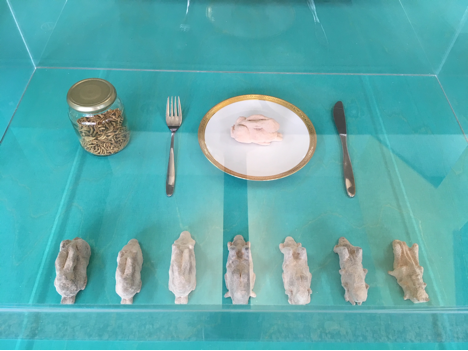 Next to Araki’s designs is another set of dishware: Neurogastronomy Cutlery, Cognitive Behavioural Therapy Dish, and Neuronal Scent Bowls, all by London-based Marina Mellado. These stylized vessels could easily appear in a modern-design magazine, but their unconventional shapes serve a functional purpose: they’re meant to help people with eating disorders control feelings of meal-related anxiety, “letting them re-sensitise the body to certain habits.” By directing users’ attention to specific sensory experiences, they provide new ways to engage in the activity of food consumption. Benedikte and I had eaten just before going to the exhibition, but one of the final pieces, Kuwaiti designer Hanan Alkouh’s Sea-Meat Seaweed, still managed to make my mouth water. Similarly to the Bugs Bunny project, Alkouh sought to find a more sustainable alternative to meat. Instead of mealworms, she was inspired by dulse seaweed: a mineral-packed superfood that tastes like bacon when fried. In her prototype, dulse is formed into cuts that resemble meat, which she says has been done in order to “keep the rich culture behind meat production that is ingrained in our society alive, by preserving the theatrics of the trade vocations like farmer, slaughterer or butcher.” In Minneapolis, where I live, this is already a reality: the Herbivorous Butcher has gained international acclaim for its range of entirely meatless deli items. 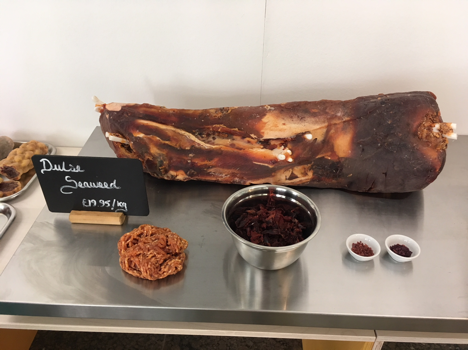 I don’t think any Herbivorous Butcher products include dulse yet; it would be fantastic if the owners could work with Alkouh to bring some to their shop. We never figured out what the “5.0” of the exhibition’s title referred to, but perhaps that’s for the best – like many of the prototypes, it’s kept me thinking. It was heartening to see the work of so many designers, hailing from all over the world, who each had a unique take on food-related issues. If more such exhibitions take place, there’ll be a greater platform for these concepts, not to mention heightened awareness of problems that people across the globe can’t afford to ignore for much longer. Food Revolution 5.0 demonstrates that finding solutions to a growing global crisis doesn’t have to be daunting or dispassionate; instead, it can (and should) be fun and humorous and even beautiful. And if some of these ideas are provided with funding to function on a large scale, I’m confident the future of food will be in good hands… and stomachs. Emma is a writer and editor based in Minneapolis, Minnesota. Whether she’s consuming food, words, sounds, images, or ideas, she’s always striving to be conscientiously voracious. Foodisms has inspired her to keep on the lookout for more ways to eliminate waste (food and otherwise) from her life.